What is a balcony glass system? Our Frameless balcony glass systems have been designed to cover and protect your balcony with style. They are designed for years and years of dinners and nice moments. That´s why they have to be resistant and safe. And they are. Lumon balcony glazing consists of two horizontal aluminum profiles mounted on the ceiling, balustrade, or floor structures of the balcony. Frameless tempered glass panes are fastened to the profiles. These 6, 8, 10, or 12 mm thick panes are extremely resistant but very easy to slide and fold. Retractable glass means that our frameless retractable glass can be fully opened, the glass slides easily to fold against the wall and is easy to use. The glass panels open easily with a handle. Once this has been opened, the glass slides easily to fold against the wall. All of the glass panes can be turned aside, or some can be left open for partial protection. The inner and outer surfaces of the sliding and folding Lumon balcony glass units are easy to clean safely from inside without a need to reach out from the balcony. Elegant aluminum profiles are mounted onto the ceiling and the top of the balcony railing. Tempered glass panes measuring 6, 8, or 10mm thick are fastened to the profiles. These panes can withstand extremely strong winds, yet they are lightweight and easy to slide and fold. Extending the glass system from floor to ceiling inside the railing. Aluminum profiles are mounted into the floor and the ceiling. Tempered glass panes measuring 8, 10, or 12mm thick are fastened to the profiles yet they remain lightweight and easy to fold. 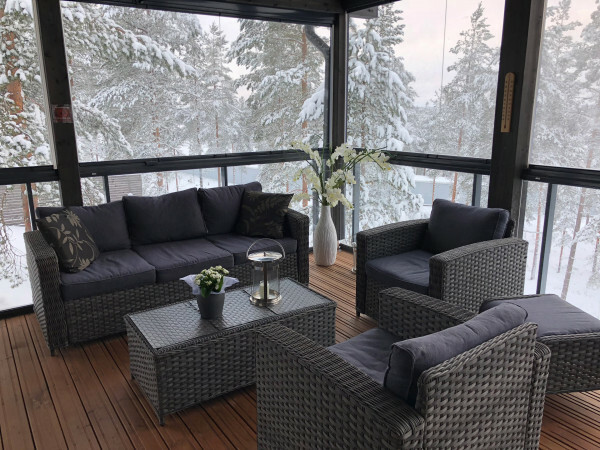 Our frameless balcony glass keeps rain, snow, wind, dust, and birds away from your balcony without reducing the amount of light that you receive. This protection means less time and money spent on maintenance and repairs to the balcony’s inner surfaces and structures. 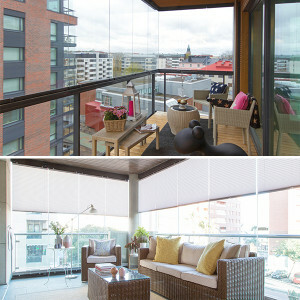 Our balcony enclosures reduce noise levels by up to 50%, so you can relax inside your home and sleep more comfortably. You can also sleep easy knowing that our retractable glass is secure, meaning increased safety for those on lower floors. A protected balcony with Lumon systems allows us to enjoy that extra bit of space we always need around the home, without the need to alter its essential function. It will provide a whole range of unseen opportunities, though, regardless of the weather - and throughout the year. We believe that a balcony is essentially a separate living space, and that this is a fundamental part of its appeal. We would not try to replicate the same conditions as the interior and simply turn it into an additional room - the balcony will always have its own rules and characteristics, advantages and disadvantages. Once we understand this, the possibilities are endless; the balcony becomes a new opportunity, and its potential is only limited by the boundaries of our imagination and our desire to explore new everyday opportunities. A balcony always in use, 7 days a week, 365 days a year; a comfortable and functional space for relaxation and enjoyment, either alone or in company, a place to unwind and seek inspiration. A place to go without the need to abandon your home comforts. Experience the sensation of being outside, but with all the security and comfort of feeling totally at home, enjoying the light and warmth and sitting back on those cold winter days in cozy surroundings. The balcony can become an area where you have control over the four seasons, where spring arrives earlier and winter much later. Create a special area in your home which you can enjoy whenever you wish. Who actually said that we need to get out of our comfort zone? And, of course, because the glass in our balcony enclosures is fully retractable, you can slide and fold the glass open at any time for fresh air and sunshine. 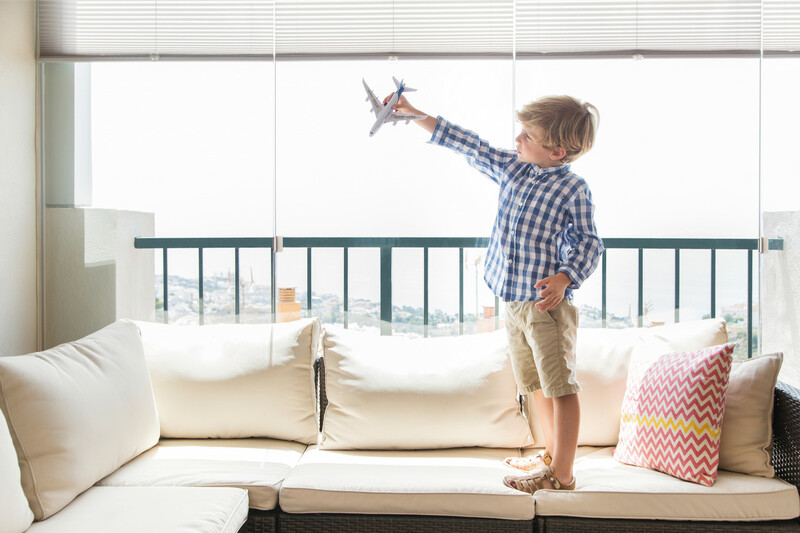 A closed balcony is a safe place for children to play. Even parents feel comfortable with the kids on the balcony. Whether you have a cat, poodle or guinea pig, an enclosed glass terrace or balcony offers a nice outdoor space for even the most sensitive pets. When all the glasses are closed the system keeps your pet on the balcony, but they can still enjoy the outdoors and get stimulated by their environment safely. Safety glass and the option of locking the balcony provide additional security. You’ll also save money on your energy bill. Multiple studies on our balcony enclosures show that creating a solarium reduces your overall energy consumption significantly. Our balcony enclosures reduce noise levels by 50%, so you can relax inside your home and sleep more comfortably. You can also sleep easy knowing that our retractable glass is secure, meaning increased safety for those on lower floors. And, of course, because the glass in our balcony enclosures is fully retractable, you can slide and fold the glass open at any time for fresh air and sunshine. See some of our balcony images from all around the world and get inspired. Do you like what you see? Do you want to work with us? Find out how.